This month we welcome Austin SCBWI member Beth Fehlbaum, a talented writer whose transparency and honesty lend authority to her books and builds trust with her readers. We're so thankful she's taken a break from writing, teaching, and feeding the local birds, squirrels and raccoons to spend some time with us! I grew up in the Dallas area. The incident that shapes my work—and influences setting—was our moving to East Texas, on the edge of the Piney Woods, in 2003. I set my books in imaginary towns that are around a lake. I live in a town that is situated near Cedar Creek Lake. I teach in a small (and I mean SMALL) rural district—I literally look out my classroom window and cattle are across the street—and it influences story, too. At this point, SCBWI Austin readers are thinking: “East Texas??? And you are a member of this chapter??? YES. I joined the Austin chapter because, frankly, I have so much regard, affection, and just plain love for so many of the YA-writing members. Every time I come to Austin, I try to figure out a way to move there! And, hey, a 4-hour drive is totally worth it if I am able to get away from my teaching job at the time . . . 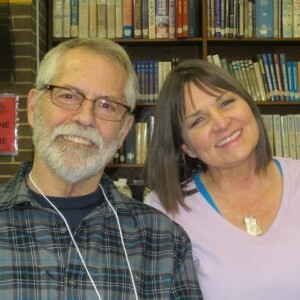 I love getting to sit down and visit with Cynthia Leitich Smith when we are at author events together. She is one of my favorite people on Earth. I’ve always written as a way of processing my life. I learned to read at my grandmother’s dining room table as she combed through the Dallas Morning News and worked the crossword puzzle. The spark for my career as a professional writer was my journey to recovery from trauma related to childhood sexual abuse, which I endured for the bulk of my childhood at the hands of my stepfather. When I was 38, I could no longer play “Let’s Pretend That Nothing Happened in Our House”—which was necessary to do in order to keep things smooth and not “upset” anyone—and I cracked. I had no choice but to deal with my scars. I had been writing poetry and short essays and sharing them with my therapist. After about six months of that, my therapist suggested that I try writing a novel to process my intense grief and rage. 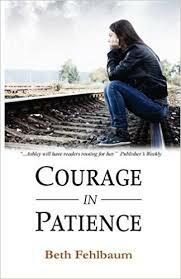 My first book, COURAGE IN PATIENCE, came from that. Then came book 2, HOPE IN PATIENCE, and finally, TRUTH IN PATIENCE—written about the same time I wrapped up my therapeutic journey. By the way, “Patience” is the name of a fictional East Texas town, and it is closely modeled on the place I live. 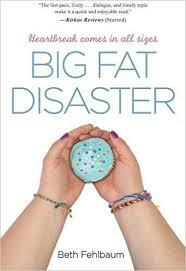 Later, I wrote BIG FAT DISASTER, which is situated “across the lake” from Patience, in Piney Creek. They’d see Daniel, my husband of 32 years . 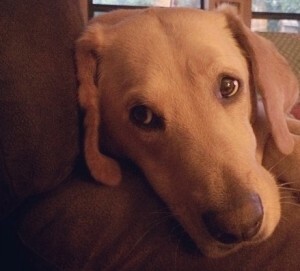 . . They’d see three dogs: my furry children: Chase, Jake, and Kevin . . . They’d likely see me talking on the phone to one of my three grown daughters and daughter-in-law. On a school day, they’d witness me at my day job as a 9th grade English I & Remedial English teacher, and loving my students like a mama (and fussing at them the same way) . . . They’d also see me writing as soon as I get home—I used to write only in the summer, but now I write year-round. I’m wrapping up writing a creative non-fiction book for survivors of trauma who are starting the road to recovery (my co-author is my former therapist, long-retired) . . . or they’d see me working on my newest novel . . . they’d see me feeding the birds, squirrels, & raccoons that live in the woods around my house. (There’s also an armadillo, but we don’t see each other much) . . . I am blessed beyond measure to live in a beautiful place that I consider my “sanctuary”, and get to do work that I love every day. My students inspire me. I teach in a low socio-economic, rural area, and at times, the stuff some of my kids go through makes me wish I could adopt each of them. I am very much “myself” with my kids, and I am very real with them. When I visit schools in my capacity as an author, the person they see before them is the same person I am in my classroom. Because I tell my kids the truth and I am not afraid to admit it when I make mistakes, and I let them know that I know what it’s like to grow up in challenging circumstances, they know that I “get” them. I try to communicate that same authenticity in my writing. In my personal life, I am most proud of being a “cycle-breaker” in my family. I broke the cycle of sexual abuse and alcoholism that plague my family of origin. In my work life, I am most proud of writing authentic stories of struggle and hope. 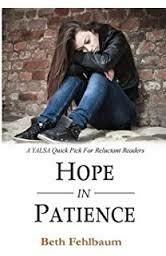 HOPE IN PATIENCE is a 2011 YALSA Quick Pick for Reluctant Readers, and BIG FAT DISASTER is on the 2015-2016 Spirit of Texas-High School Reading List. The moment a story I’ve been struggling with “clicks,” and I know exactly who this person is and the world she or he lives in. Sometimes it’s a shocking twist that I didn’t know would happen, and that’s amazing, too. I LOVE that feeling when the doubts I had fall away and I know I have a strong story on my hands. I hope readers find me as authentic as I first found Chris Crutcher, that day I picked up Staying Fat for Sarah Byrnes and began reading the story of a person as real as me. I want them to experience the goose bumps from head-to-toe when they recognize themselves in the story, and, most of all, I want those who are coming from a place of hopelessness and fear to be inspired by my characters and believe that they, too, can persevere and thrive. Author Bio: In addition to writing Young Adult Contemporary Fiction, Beth Fehlbaum is a high school English-Language Arts teacher who frequently draws on her experience as an educator to write her books. 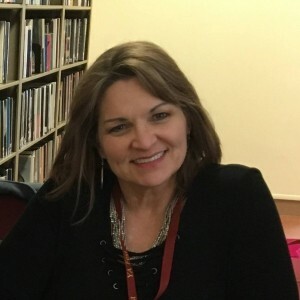 Beth is a featured author on the 2015-2016 Spirit of Texas Reading List- High School for the Kirkus Starred Reviewed BIG FAT DISASTER (Merit Press/F+W Media, March 2014) and THE PATIENCE TRILOGY (COURAGE, HOPE AND TRUTH) (Steady On Books, April 2016). She is also in-demand as a panelist, having presented/appeared at the TLA Annual Conference, the ALA annual conference, YALSA, and N.C.T.E./ALAN.